With Daredevil: Dark Nights #5 coming out this week, it’s about time I get to my (very quick) reviews of Daredevil: Dark Nights #3 and #4. You might wonder why I’ve decided to review the two together, and it does seem like an odd choice. Daredevil: Dark Nights #3 marks the end of one story arc, and #4 marks the beginning of another. They are by two different writer-artists, Lee Weeks and David Lapham, with two completely different styles. To be honest though, the ways these issues are different is kind of what makes them interesting. As you may recall from my previous reviews of Dark Nights #1 and #2, I haven’t been completely sold on Lee Week’s story. It has been absolutely pitch perfect when it comes to the art, and has featured a strong supportive cast, even while consisting of characters which are almost completely new. However, I’ve felt an unfamiliar distance to the main character. The story has been ripe with first-person narrations, but it is almost as if Week’s take on Matt Murdock has seemed too saint-like. In many ways, Daredevil’s physical and mental struggles throughout the story have mirrored what was seen in Frank Miller’s legendary Born Again story arc, but without the fall from grace at the onset to fully ground the story. In this final issue, we get a little more up close and personal with the main character, and the arc comes to a satisfying close with Daredevil: Dark Nights #3, but there is a reverent tone that I’m finding isn’t quite my cup of tea. If I were to liken this issue and the two before it to a genre of music, it would be classical music. Very pretty, moderately engaging, but not the kind of thing that makes you want to dance. 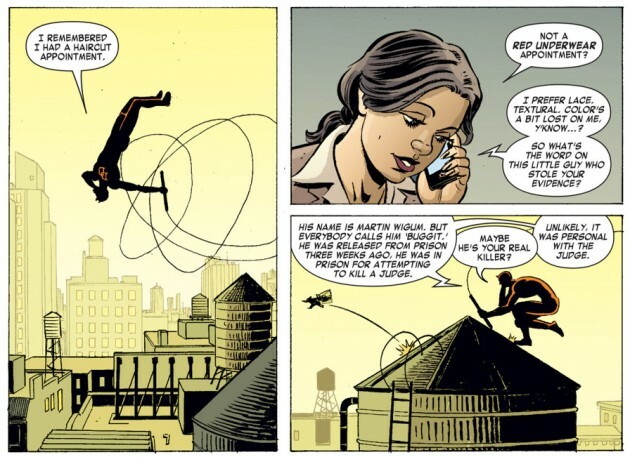 Daredevil: Dark Nights #4, by David Lapham gives us something else entirely. The artwork is brighter, with considerably less detail, and the story itself seems less ambitious. However, I don’t mean that in a bad way, quite the contrary. This issue accomplishes its goals admirably and is really a lot of fun. It is also much closer to the tone of the current main title, and uses the same cast of characters, which may be one reason I personally feel more at home in the world presented. If there is one slight problem I have with this issue, it is that it seems just a tad over-crowded. Buggit is a fascinatingly absurd little guy, and I love the idea of having the Daredevil-sized story happen in parallel with the big monster threat which is simultaneously being handled by the Avengers. But then there’s the Shocker and Buggit’s connection to Matt’s client, and… Actually, never mind. I kind of like the Shocker showing up, because that’s what a really bad day, Daredevil style, would look like. 😉 All in all, I really enjoyed Daredevil: Dark Nights #4, and am really looking forward to reading the second half of the story on Wednesday. Well, those were just some of my (brief) thoughts. Agree? Disagree? Have your say in the comment section! I can see from the panels above that Kirsten McDuffie is in Dark Knights. Given that she has not actually been in that many issues of the main series, how was it handled and do you think it added anything to their overall chemistry. Yay! I’m timely this time. I get my comics delivered approximately once/month so I usually have to avoid your reviews until I’ve caught up. Got my delivery on Saturday so am able to read these right away. @Ethan, The way they use Kirsten places the story earlier in the timeline than the main series. She’s still working for the DA’s office and they’re dating. I liked both stories. The earlier one (#1-3) was a bit long with all of the slogging through the snow, but I did find it interesting that they pulled a double switch at one point so the person I thought was DD was actually someone else entirely. And then my first assumption as to his motivation (altruistic) was pulled out from under me too. I enjoyed the first three issues of Dark Nights. Definitely a different feel from the current book. I really enjoyed the different twists and turns in the last issue that I was not expecting and it really added some depth to the story. But overall I think you are right, the story was a little gimmicky and a little to on the nose at times. And was it just me or were the SHIELD agents completely thrown in for little reason? I mean why would Nick Fury the head of an international peace keeping force be keeping that close of tabs on what DD is doing. It just seem way to small game for him, how did he even know what was going on? But anyway, still a pretty solid story with great art. Still haven’t got around to reading # 4 yet. Yeah, I’ve been catching up on my DD reading as well. Overall, I liked Weeks’ story in #1-3. It had a down-to-earth noble goal for Matt to achieve, the troubles and help he faced were challenging and insightful, and the art was just crazy beautiful. It did have a kinda Born Again vibe to it, but instead of redemption, the focus was more on endurance. Matt may question why he does it, but seeing how he struggles to do so regardless was fun and interesting to see. in my opinion 4 & 5 by Lapham and Laoughridge are a classic Disney exploit, I suggest boycotting the series I have done until the writers of the first 3 are back on DD, im bothered that Matt’s fighting a giant monster and saddened that disneys shall we say saltry , gimmicky ways as I predicted would be visable. I cant believe situations like this, and its sad that marvels true ways have been givin a mickey mouse feel. in my heart Marvel will always be that brooding red way of life but i’m Throwing out these issues I paid good money for just so no one will ever have to see this crap again.